Vietnam Internet veteran, Minh Bui, share his opinions on the five key things that we should know about Vietnam Ecommerce. If you are interested in expanding your business to this country, you shouldn’t miss this article! 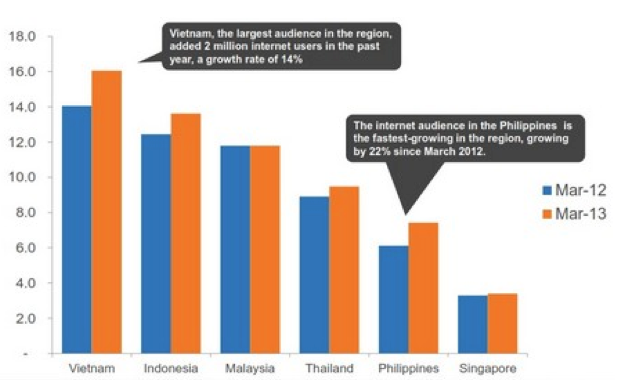 According to ComScore’s 2013 Southeast Asia Digital Future in Focus report, Vietnam now has the largest online population in Southeast Asia with 16.1 million monthly Internet users [desktop]. 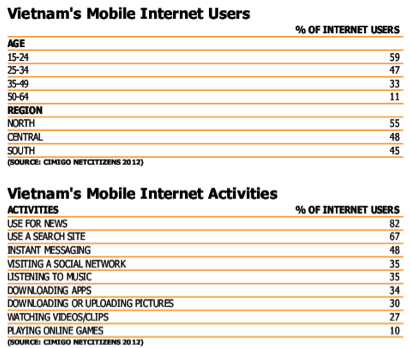 The number of Internet users in Vietnam is 32.6 million persons or 35.6% of Vietnam’s population (91.5M). Good news for those who are interested in Vietnam’s ecommerce; 61% of Internet users have already bought goods online. This is thanks to the Groupon clone wave going on for the last two years with hundreds of group buying sites promoting online shopping activities with super discounted prices. Desktop/laptops are still the main devices for web surfing (80%) with an average time 16 hours per week. The two biggest social media sites in Vietnam are Zing.vn (VNG Corp) and Facebook. Facebook grew slowly in the last few years due to some technical restrictions from the government. But now there are over 12 million Facebook users, up more than 200% during the last 12 months. Facebook is now taking over the No.1 social media network position from Zing. Lazada.com.vn – Lazada Vietnam has grown rapidly with an aggressive team for the purpose of becoming Vietnam’s largest B2C company. Thegioididong.com remains one of the top e-Commerce players in term of revenue with the advantage of offline stores (200+ stores) and a strong brand in customers’ minds. Vatgia.com is the largest C2C site backed by IDG Ventures Vietnam, and received an investment from Mitsui Japan with a rumoured valuation of $75M. Tiki.vn started with an online book sales model and extended to sell digital and fashion products since last year. Tiki has series A & B funding from two companies from Japan: Cyber Agent Ventures and Sumitomo. 123.vn and 123mua.vn are not at the top but still remain key players with support from the mother company VNG valued at $200M in April 2013. Goldman Sachs and Tencent invested in VNG. VNG is the largest Internet company in Vietnam in terms of annual revenue (~$100M, mostly from games). VCCorp’s eCommerce department has several sites in the top 3 of different niches: C2C, classified, group-buying… VCCorp is one of the biggest Internet companies in Vietnam, backed by Intel Capital/IDGVV. According to Mr. Tuan Pham, CEO of Founder Institute Vietnam, nearly 50 investment deals were made in Vietnam from 2011 till now. Start-ups in Vietnam are now more mature after few fluctuated waves 2003-2005, 2007-2009, 2011-now. The young guys in Vietnam with tech advantages and strong wills always want to change the world. According to Dung Nguyen, Co-founder/Chief Editor of TechDaily.vn, a tech community site in Vietnam, “After a long period of putting high priority on consumer goods and electronic products, now many startups in Vietnam are moving to intangible products and services. There are some players such as crowd funding site iG9; travel site MyTour.vn, iVivu.com; or content site Haivl.com and cab.vn”. 123.vn 123mua.vn focusing on women products. These sites are under VNG’s wing. For more information on Vietnam’s eCommerce in 2012, please read “5 factors boosting Vietnam’s e-commerce space in 2012”. Editorial note: This article is a special one that we mention as Guest Post from Minh Bui, Founder Institute mentor, visited all Southeast Asia countries, and has frequently traveled through the top 5 major countries Indonesia, Malaysia, Singapore, Thailand and Vietnam to explore Travel & eCommerce space in Southeast Asia. He sends this article to thumbsup editors to upload for thumbsup readers. Content written by him does not reflect our thumbsup editors idea at all, it is his personal view. This article is supposed to be intellectual property of the author that thumbsup has been officially authorized for this publication. In case of utilizing this article, kindly honor by referring to this author and linking back to the original text. Thanks.